Kidbuddie prides itself in not only a superior and ultra safe product, but high levels of customer service. Thank you for your concern, your support is greatly appreciated! The playground equipment certainly does look beautiful. What a kind, generous gesture. I’m impressed to see this kind of service in Africa. It shows that there is scope for economic growth and development. Very impressive indeed. We have a beautiful country that is spoiled by incompetence and low class behavior. I’m however optimistic that things will come right. I found your website and love your products! The guys did an excellent job! One thing for sure is that the quality of your products are excellent. 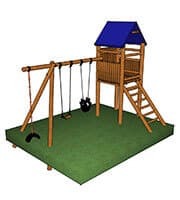 It is very sturdy and I have peace of mind when my daughter plays on it. They can make your children’ s dreams come true.